Just a quick note to let you know that I’m having a Mother’s Day SALE during the month of May. I have been doing this for the past couple of years and it is something that many fans look forward to. Both of my albums are on sale for $9.99 each (reg. $14.99/$16.99 each). Either album make a great gift, but I highly recommend picking up The Lullaby Album if you haven’t already. Please don’t think this album isn’t for you if you aren’t a parent. This album was a collaboration that my Mother and I did together, and I wrote the songs during the first few months of new motherhood after my first son was born. The songs soothed him to sleep on many occassions and they have a special place in my heart always. And, I might add, because I’m sort of a childrens music snob I purposely wanted to create a lullaby album that parents could enjoy as well. No annoying jingles, weird sounds, or synthesized instruments. Disc 1 is fully orchestrated with powerful arrangements of all of the lullabies – and intended for the parents to enjoy. Some of the arrangements you would be surprised to know they were your favorite lullaby. For example, my arrangement of “Twinkle Twinkle Little Star” is a refreshing Celtic version. Disc 2 is Solo Piano only, specially for those little ones who need something more simple and calm. “The Lullaby Album”, which is a 2-disc album, is on sale for $9.99 (reg. $16.99). So pick up a few copies and give the gift of music to the favorite mothers in your life. I have several promos for this album on youtube. Here is one to wet your appetite, and simply click on the video image to go straight to my youtube channel to see more. I’m excited to let you know that The Lullaby Album made it on to, not one, but TWO “Top 20” lists for 2009. This is a great honor for my Mom and I, and we are thrilled to be included on the list amongst such great other artists such as Yanni, David Lanz, Paul Cardall, and Peter Katar to name a few. You can find the lists here, both provided by Kathy Parsons and Michael Debbage. It is very clear by the title of the album that this is a specialty project. But how is this album different from any other lullaby album? It is a very personal project with Jennifer Thomas dedicating it to her first-born, Preston. And to add to the tie that binds, Jennifer extended that collaboration to her mother Carolyn Southworth, keeping it all in the family. But to those of you that may be put off by the specialty label, the album is a double feature, one of which includes some orchestration, resulting in an album that not only has a special purpose but also includes the entertainment factor. The Lullaby Album includes 3 original compositions from each artist with the remaining balance relying on some very familiar tunes. On the latter, the album opens with the infamous “Brahms Lullaby” with Thomas taking the lead on the arrangement. In complete contrast, Thomas gives “Twinkle, Twinkle Little Star” a significant makeover thanks to the wonderful orchestration assistance from Jace Vek. As far as her original compositions are concerned there is the warm and fluid “Baby Of Mine” in contrast with the more classically based “Un Petit Nocturne” both impressive for completely different reasons. Southworth’s cover contributions come courtesy of the mystical “Old Scottish Lullaby” and the Appalachian “All The Pretty Horses”. But her best original contribution and for that matter the album’s finer moment, is the utterly moving “Unseen Angel”. The song opens with Southworth’s memorable melody that is fleshed out with Jace Vek’s inspirational orchestration, paralleling the emotive tug that John Barry and Tim Janis are more than capable of doing on any given day. Whether in the stripped down version found on the solo disc or with the orchestration, this song alone is worth the price of admission. Back in 2006 both mother and daughter released their debut albums. Southworth focused on a mainstream effort while Thomas introduced her unique blend of classical trimmings clothed in a New Age mainstream effort, bringing a sense of warmth to her music. Here they have managed to blend their own musical influences to compose a specialty album that also includes an intrinsic entertainment value. With or without child, The Lullaby Album double feature is not only an album of significant quantity but also one of quality material. Whether or not Southworth and Thomas will collaborate again remains to be seen. But there is no doubting that we can expect to hear more wonderful material from these two very different artists. I just wanted to let you know that I am offering a fantastic discount on my albums from now until the end of 2009. They make terrific Christmas gifts and stocking stuffers! Buy 2 or more cds, and they are $9.99 each. And for kicks, Key of Sea is one sale for $9.99 each even if you buy just one. Don’t say I didn’t love you this year! Click here to visit my Music Store. Happy Holidays! There are lots of fun photos, and insider info 🙂 Enjoy! Oh and let me know your thoughts too. When Jennifer Thomas’ newborn son refused to fall asleep at night, she got an inspiration. Thomas, a pianist and composer, set little Preston in a baby swing and started playing sweet lullabies on her piano. The baby melted into slumber as quickly as if Mr. Sandman himself had made a house call. 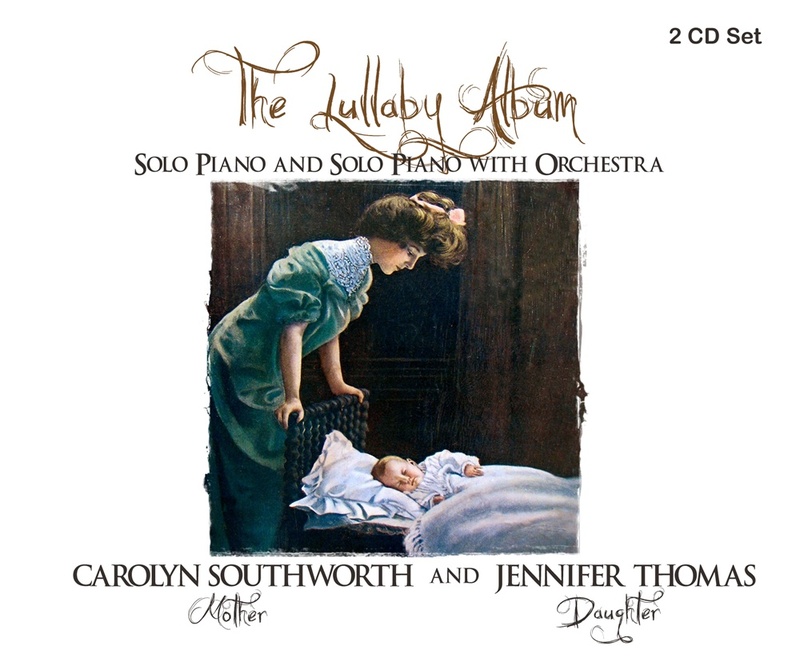 The result of Thomas’ revelation is “The Lullaby Album,” created by Thomas and her mother, Carolyn Southworth, and personally tested by Preston. The music is relaxing enough to soothe not only infants, but stressed and frazzled adults. Southworth, who grew up in Pendleton and now lives in Camano Island, Wash., said her daughter was at her wit’s end with Preston. Once Preston started getting his sleep, Thomas mulled over the idea of creating a collection of traditional and original lullabies to help other parents lull their babies into dreamland. She asked her mom to compose some of the songs and play on the two-CD album with her. “I didn’t have to think about it for more than two seconds,” Southworth said. Southworth, who started playing violin and piano at the age of five, is an alumnus of the Pendleton School District’s strings program. “I was one of the original kids under Shirlene McMichael,” Southworth said. McMichael taught in the ’60s when Pendleton served as Suzuki’s first American pilot program for a method of teaching stringed instruments that involves immersion and memorizing by rote. Though the method was wildly popular in Japan, it didn’t reach the United States until school board member Betty Feves talked the board into giving it a try. Southworth, daughter of Dr. Derrell and Thelma Lindsay, also took private violin and piano lessons. She discovered music theory in Roy’s classroom. The lessons took so well that, later, at Brigham Young University, she “sat there twiddling my thumbs for two years” in the school’s required music theory classes. While Southworth taught all four of her children to play piano, the lessons caught fire only in Jennifer, who seemed to spend every spare moment practicing. Her drive paid off. She’s won numerous competitions and Thomas’ music caught the ear of independent filmmakers and has been heard on NBC’s Universal Sports network. With the lullaby project, mother and daughter divided the composing and orchestration almost down the middle. The women collaborated from afar, since Thomas lives an hour-and-a-half down the road in Fall City, Wash.
One of Southworth’s compositions is “Unseen Angel,” inspired by a friend who suffered from multiple organ failure and seemed past hope when she revived. Emmy Award-winning pianist Jace Vek orchestrated the song and Grammy Award winner Paul Speer engineered and mixed the album. The album contains vocals by Jillian Goldin and Lori Cunningham.